The purpose of this quick start guide is to provide you with a brief overview of the 5GTANGO/SONATA platform and then get you up and running with with this platform in the quickest and easiest way possible. Here you will find a brief explanation about what 5GTANGO does, how to install it, how to use it and how to get technical support if required. This tutorial is not an exhaustive guide to all features of 5GTANGO, but rather an “umbrella” document that will guide you to the more extensive documentation if required. To setup 5GTANGO you must install the three major components of 5GTANGO and OpenStack in the order shown is the following bulleted list and as highlighted in the following diagram. 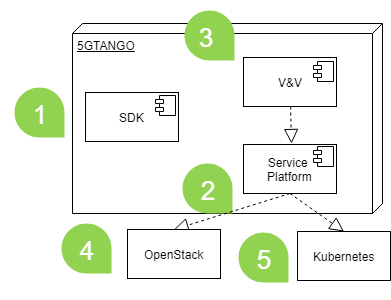 Once the 5GTANGO platform is installed, you can now create network service packages, deploy them and run tests against them!